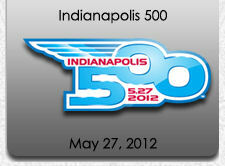 ﻿ Indianapolis 500 Transportation - Affinity Limousine & Tours, Inc. Your Indianapolis 500 Limousine Specialist! The Indianapolis 500 at the Indianapolis Motor Speedway!! Don't miss the greatest specatacle in racing on May 27th, 2012. Whether you are attending festivities throughout the month or just coming in for race day don't forget about your transportation needs! Sit back, relax, and forget about the traffic and let us take the stress out of getting you where you need to be! The Indy 500 is a one day event but all through the month there are activities you would enjoy. The complete list is on the website of the Indianapolis Motor Speedway. Give us a call at 317-870-5466 for rates and to make reservations. Serving Indianapolis and surrounding areas and states, Affinity Limousine & Tours can provide you with quality on time transportation. Whether you need transportation to one of our many sporting events such as the Indianapolis Colts or Indiana Pacers, transportation to one of our cultural events at Clowes Hall or the Murat Theatre, or just a tour of Indianapolis, we are prepared to meet your needs. We welcome your review of our company and staff and are looking forward to serving you. If you are considering employment as a driver in the transportation industry, please view our driver information. Our flagship car. A must to experience! Flat screen T.V. 's, surround sound and more. A coach of elegance and technology. Copyright � 1995-2007, Affinity Limousine & Tours, Inc.